K. Dot. King Kunta. Kung Fu Kenny. Kendrick Lamar goes by many nicknames. However, no nickname may be as deserved as the title of King Kendrick. Since his major label debut in 2012, the man has been unstoppable. He’s the biggest and most well respected artist of his generation, and is easily already one of the greatest hip-hop artists of all-time. He shows no signs of stopping anytime soon, as his latest album DAMN. has become a cultural phenomenon since its release in April, 2017. The song “Loyalty” is the third single off that album, and is a duet between Kendrick and Rihanna. Kendrick wears black chucks in this music video with pop star Rihanna. The song is funky and brooding, as Kendrick brings the energy way down to address what loyalty really means. The track does something not often seen by sampling a song that’s current and still on the charts, using a sample of Bruno Mars’ “24K Magic”. Kendrick does an ingenious thing by having Rihanna split eight bars, and it completely gives the song a different feel from any of her other features. Her flow is silky smooth, and it really makes this feel like a duet instead of just a guest singing a chorus. Overall, the song may be the most popish on DAMN., but it still showcases how Kendrick is undoubtedly the King of Hip-hop. The music video follows Kendrick and RiRi traversing Los Angeles, as people continuously around them come from all angles. They give off this real Bonnie and Clyde vibe as they fend them off in fist fights and gunfights. 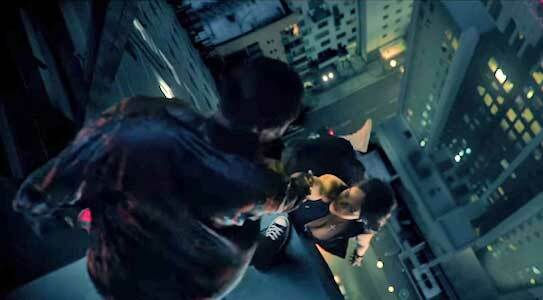 At one point in the video, Rihanna puts all her faith in Kendrick as she trust-falls off a tall skyscraper, with only Kendrick holding onto her hand keeping her from death. That’s pure loyalty. It’s during this scene that Kendrick wears a pair of black chucks that we really get a great view of as the camera zooms in and out around them. This, like the rest of the videos that have been released with DAMN., is an incredible piece of visual art that elevates both the rap and music video genres as Kendrick sits comfortably on his throne. Show your loyalty to chucks by getting a new pair. Click on the links below.